LED 2x4 lensed troffer grid light fixtures with 2 - LED lamps. LED 2x4 light fixture lensed troffer with 2 - LED lamps is an office light shape you may be familiar with but more energy efficient than ever. 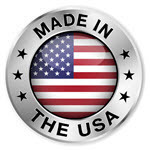 This is a USA made LED troffer and comes with the LED light bulbs included and is made to replace fewer efficient fluorescent lighting that you may have in your building. It's a universal voltage of 120 to 277 volt which automatically senses the voltage you have and works properly and there is no ballast, the lamps are directly fed to voltage. If you have grid ceiling offices where high productivity at a reasonable cost is needed, then this troffer LED 2x4 grid light might be a good solution. The 2x4 LED lensed troffer is usually not used throughout an entire office space, but rather as a way to complete a ceiling grid so it has a similar spacing. 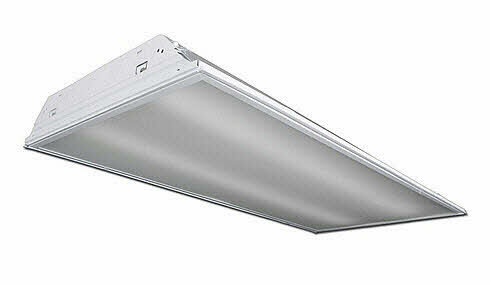 It's different from LED flat panel lights as the panel version has no light bulbs, just an LED array. They install the same as standard light fixtures and these have an 2 LED lamps inside the fixture for and even light across the face. Housing is die-formed and embossed from cold rolled steel. The prismatic lens is held within a hinged steel frame door like the old fluorescent fixtures, everything is the same. The heavy gauge door frame hinges downward on either side and is held in the closed position by two positive cam latches. Knockouts are provided on ends for continuous wiring of many ceiling lights. The rated life of the LED T8 light bulbs are 50,000 hours and they come with a 5-year warranty. Most building owners and managers have seen excellent paybacks replacing fluorescent troffers with these 2x4 LED lights, often installed with special utility rebates. If you have older fluorescent light fixtures, it probably makes sense just to buy new instead of using an LED retrofit kit. The difference in the investment would be marginal and by using these you get a completely new LED energy saving lighting system. If you want to know how much money you’ll save and which option is better to go with either buying a new light fixture or retrofitting the existing one, we have an energy savings payback calculator on the left column of our website for download. You can get a good idea as to what your savings will be and how fast you can get a payback. Of course there are many different types of LED light fixtures that we have including panel 2x4, direct indirect and a complete selection of more standard offerings like this. Sometimes all you need is a basic light fixture like this for a certain project to keep costs low. - 2 - 15 watt LED tubes included. - Choice of light color even cool white 4000K or bright white 5000K. - 50,000+ hours lamp life. - Prismatic lens LED troffer. - Dimension: W = 23.75" x L = 47.75"
- Smooth edges for easy handling, electrician friendly.